You taught your child well. ore than ever, higher education is a major investment. And while learning can certainly be its own reward, we will work tirelessly to prepare your child for a successful career as well. Simply put, a BU education opens doors. Our graduates are ranked #21 in the US for employability. So it shouldn’t surprise you that 92% found employment or went on to graduate programs within six months of graduation. This is because our graduates emerge smart, curious, mentally agile, ready to lead, and eminently employable. Take a look at the Forbes “30 Under 30” list. Twenty named in the last three years are BU alumni, including Steve Ramirez, whose work may have profound implications for treating PTSD. The Hollywood Reporter calls BU “Hollywood’s secret training ground” because our alumni have won Oscars and Emmy Awards, and one serves as chairman of NBCUniversal. Alumna Carrie Hessler-Radelet joined the Peace Corps in her twenties and recently served as its director. Just imagine where BU can take your child. Speaking of alumni, we have over 300,000 worldwide in 189 countries. They’re a valuable resource for our students through our vast Career Advisory Network—which includes thousands of alumni advisors worldwide. CEOs, politicians, celebrated painters, groundbreaking researchers, or inventors can answer questions, give career advice, and maybe even make an introduction or two. We teach at a prestigious level. oston University is a major teaching and research university. The prominence of our faculty and research was honored in the most flattering manner: we were invited to join the Association of American Universities (more about that later). Here at BU, academics are exciting, inspiring, and rigorous. We educate our students to become entrepreneurs and archaeologists. We develop filmmakers and design mechanical engineers. We nurture poets and environmentalists. And we do it through combined liberal arts and professional studies that develop the agile, adaptive thinking that is critical for success in today’s world. FACULTY: THE HEART, SOUL, AND BRAIN OF BU. Our commitment to teaching is apparent through our investment in faculty and their research. We’ve added 94 new faculty positions in the last several years, with more on the way. the creation and business of art in post-apartheid South Africa. There’s also Professor Jesse Shore’s work on the benefits and limits of collaboration in business. LEARNING BESIDE THE CRÈME DE LA CRÈME. A BU student keeps extraordinary company. Our commitment to excellence has attracted attention—and more than 62,000 applications—from ever more accomplished young scholars. Your son or daughter will study alongside classmates who ranked at the top of their high school classes. And they’re not just book smart. One interned with Parliament in London. One performed in the US National Figure Skating Championships. One won the Jeopardy! College Championship. Yet another conducted biology research in Ecuador and the Galápagos Islands. 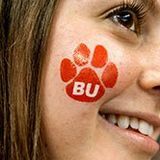 BU’s students are impressive, and we know, as their classmate, your scholar will make them even more so. learly, research is important to us. But why should it be important to you? At BU, research isn’t just for graduate students. Undergraduate research forms a rich ecosystem of ideas and discovery across the University. It allows students to experience the thrill of discovery, to feel pride in adding to the world’s knowledge, and to gain a deeper understanding than they ever could simply from textbooks and lectures. With more than $1 million in funding, the Undergraduate Research Opportunities Program (UROP) affords exploration in any academic discipline. What will your child discover here? AAU: THE GOLD STANDARD. So just how prestigious a research university is Boston University? Very. Our membership in the Association of American Universities (AAU), an exclusive group of leading North American research universities, is by invitation only. BU was chosen for its quality of academic research and scholarship and its excellence in undergraduate education. There are only 62 members, including just six in college-rich New England: Harvard, MIT, Yale, Brown, Brandeis, and, yes, Boston University. ew schools offer the international exposure and opportunities that we do. BU is the world in microcosm. We are one of the top destinations in the US for international students. In fact, in a recent survey, students cited frequent interaction with other cultures and perspectives as one of their favorite aspects of BU. Academically, all of our 10 undergraduate schools and colleges engage in global activities. Our faculty conducts research in some 80 countries around the world. And weâ&#x20AC;&#x2122;re especially proud of our Frederick S. Pardee School of Global Studies, focused on advancing human progress and educating the next generation of global leaders. We teach students to thrive. ur lives become more global and interconnected every day. Today’s students will graduate into a world where what they are professionally is less important than how they think, create, adapt, collaborate, and connect. Boston University’s innovative University-wide general education program prepares students to create the future rather than just adapt or react to it. We call it the BU Hub, and it ensures every BU graduate will possess the essential knowledge, skills, and habits of mind needed to think deeply, generate new ideas, and put them into action. In the Hub, students explore areas ranging from global citizenship to scientific and social inquiry to ethical reasoning, in courses both in and out of their major. We’re confident your child will leave here well prepared to lead, create, and seize opportunities throughout a rich, rewarding life. The latest innovations and accolades in academics and research at Boston University.